In the last two issues I explored the intrinsic factors that drive us towards running. A theme that filtered to the top was simply the innate need to move our bodies, and the necessity of movement that makes us feel whole and complete. This movement we label “running” yields us many physical and mental benefits. The byproduct found through running is connection – with nature, others and ourselves. Just this morning I sat looking out a window on a barstool in a local coffee shop. I had just completed a run in the trails west of Bend, and engaged in my equally favored hobbies of writing and drinking richly flavored, dark-roasted coffee. My run was long. I ran with nature. I ran with someone else. I ran with myself. I pushed the volume as an attempt to build back the fitness I’d lost over a long winter. Within the struggle I found immense joy. Testing myself to discover what I’m capable of is another innate quality that year after year, has me exploring something. Something physical, mental and spiritual. But I found another connection. As much as I want to write a column with meaning and continue to explore why the trail matters, I’m distracted by the Blue Suunto Ambit Sport watch laying silently beside my Americano. It is connected, uploading to Strava and well, I’m command-tabbing between this document and Strava waiting to pour over my data. In all fairness, I just purchased this device and am a bit of a gadget geek. As well, I’m trying to be diligent in keeping my easy runs easy, and stay below my maximum aerobic heart rate. Perhaps it’s warranted to explore some of the extrinsic factors as to why we run, ride, or explore the Pacific Northwest. Since I’m currently enamored with this device that continually reminds me just how skinny my wrists are, let’s discuss what we cannot deny. Our love of gear. Whether you are a geek or fashionista, endurance and outdoor sports offer seemingly unending options for gear and clothing. The local running store I regularly peruse has a wall of more than forty shoes for me to choose from, and those are just the trail options. Meticulously placed are multiple brands with several designs, and a variety of color options per shoe. We must decide if we need trail or road, neutral or stability, and zero, 4mm or 8mm drop. It now seems maximal is the new minimal. 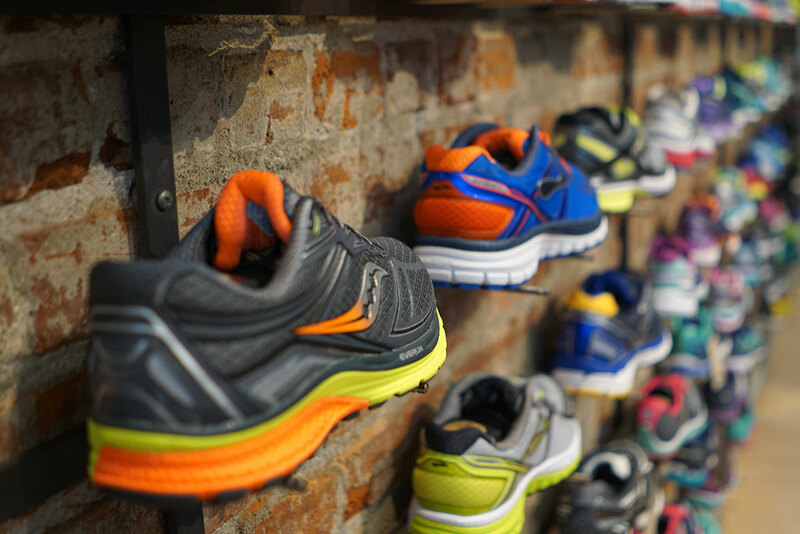 Shoes alone can have both the newbie and experienced runners alike spinning from indecision. While shoes are literally the foundation from which to begin, the plethora of items one can purchase to be fully kitted is astounding. The watch (my weakness) is no longer limited to the round analog device strapped to a wrist or dangling from a lanyard around your high school coach’s neck. Now we ponder the following: do I purchase with or without a heart rate monitor? What about GPS? Should I go with bluetooth capabilities so I can sync to my computer and phone? Should I consider foot pod or power meter add-ons? Oh the joy! Then we must consider shorts (5,7, or 9-inch inseam), compression tights, track pants, yoga pants, leggings, capris or knickers. The options can be exhausting and exhilarating. Shirts are as daunting and delightful: sleeveless, short-sleeve, long-sleeve, base-layer, mid-layer and outer-layer. Six months out of the year in the Pacific Northwest we need a good vest, jacket and windbreaker. Do we opt for waterproof or just water resistant? Zip-up or pull-over? With or without hood? How about reflective materials for those early morning and late evening adventures? Should I consider a pair of arm-warmers? This staple of the cycling scene is now trending with runners. Myself, I typically head out wearing a short sleeve shirt and arm-warmers as it is not uncommon for temperatures to fluctuate more than 20 degrees during a run in Bend. Hats are a requirement in the Pacific Northwest, especially for those like myself whom long ago shed what natural dome-top warmth we once possessed. However, despite the necessity of this item, I find it the least interesting. Other than the resurgence of the now ubiquitous trucker hat, most run-specific headgear isn’t fashionable in my opinion. Now that I’m fully dressed… wait, I completely skimmed over socks. Socks are significant, and not just to poets and punks. The U.S. sock market is reportedly $1.8 billion, no doubt the reason the sock company, Stance, easily raised $86 million in funding in 2015. Point being, do not overlook that which often cannot be seen. Speaking of that which cannot be seen, don’t get caught past sunset without a headlamp or waist light to illuminate the glowing eyes of a predatory mammal around the next bend. Jeff Browning wrote an entire piece on night running and lights. You can find it in the Fall 2016 issue, currently on racecenter.com. Now that I’ve rekindled my fear of the dark, let’s discuss that Pacific Northwest recluse: the sun. Not that it matters to us much, but it seems a new sunglass company is launching with every sunrise these days. A cursory search on REI.com for men’s sunglasses yields 359 matches. Who has time to browse through that many options? Well, being that I need a new pair, I guess I do. Should I opt for polarized, photochromic, or interchangeable lenses — which color best compliments my Suunto? Of course, once decked out head to toe, there are numerous additional items that any respectable runner must have in his or gear list. Hydration and food are necessary on runs of moderate length. As a result, dozens of companies specialize in the growing market of hydration vests, waist packs, hand-held bottles, and hydration belts. I didn’t intend to use all this space on gear and apparel. I also rarely plan on walking out of the local gear shop with what’s in my bag. I’ll have to delve into other extrinsic factors to why we run in another issue. It’s time to head home, put on my shin splint therapy sleeve, and roll out my calves while I sit on a lacrosse ball. Paul Lieto is the Editor for RaceCenter Magazine. He currently lives on the road where he writes, runs trails, and helps others live a more vital life. He is co-founder of Dirty Good Company. Follow Paul at dirtygood.co and @dirtygoodco on Instagram and Facebook.